If you wish to purchase any of these books, click on either the title or the book cover to be directed to Amazon.com. By Shoshona Lepon In Joseph the Dreamer, young readers will be charmed once again with witty verse and spectacular illustrations. The story follows Joseph as he is sold into slavery, imprisoned in Egypt, and finally reunited with his brothers and father. By Jacqueline Jules When drought befalls Canaan, Jacob�s sons travel to Egypt looking for food. They do not recognize their brother Joseph, now governor of the land, who wonders whether his brothers have changed since the day they sold him into slavery. 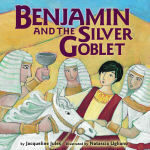 Joseph hides his silver goblet in youngest brother Benjamin�s pack as a test for his brothers. Would they abandon Benjamin, too? Told through the eyes of young Benjamin, the story of Joseph�s test and the dramatic reunion of the brothers will capture the imagination of readers young and old. By Patricia Pingry A favorite son is betrayed by angry brothers but G-d uses their evil deed for a great good. By Brian Wildsmith Most libraries probably own several versions of the popular biblical story about Joseph, but this one is well told and particularly handsome. Wildsmith's ink-and-watercolor artwork has never seemed more polished, his colorings more carefully shaded (especially where the blue of the desert sky meets the gold of the sand). He also uses the Egyptian setting of pharaoh's court to beautiful effect, making it come alive with pyramids and hieroglyphic-encrusted walls and spires climbing to the sky. The gilt edging of the pages also gives the book the glow of majesty. For any library needing (or wanting) just one more edition, this book makes a fine addition to religion shelves. By Sue Kassirer Retelling the biblical tale of Joseph and his brothers in short, staccato phrases, Kassirer comes up with a surprisingly effective book for young readers. The old story, with its themes of sibling rivalry, cruelty, and forgiveness, has lost none of its power over the centuries, as the producers of Joseph and the Amazing Technicolor Dreamcoat found out. In fact, this book would be a good introduction for young children, who will enjoy the musical much more if they know the basic plot. Jarecka's vivid, dreamlike pictures, shot with deep, sunny beams of pure color, interpret the story in a series of narrative tableaux and impressionistic dream scenes. A good old story for new readers. Simple sentences in an easy-reader format describe the life of Joseph, who, after rising to a position of power in Egypt, forgave his brothers for selling him into slavery. Appropriately, each page is saturated with a wide spectrum of color, applied in an impressionistic manner that reveals the brush strokes. By Dee Leone Rebus-type picture stories begin each unit. Puzzle pages reinforce the stories and provide practice with colors, numbers, shapes & other imporatnt concepts. Also includes idea pages with songs, games, projects, and more. By Yaffa Gottlieb Serach's Song tells the story of how Serach, granddaughter of the patriarch Jacob, told him that his son Joseph was alive. By Alice Joyce Davidson These colorful books introduce favorite Bible characters to eager young hearts. Children ages 4 and under will adore these colorful sturdy board books. Each specially shaped, die-cut book offers bright, four-color illustrations and rhyming verses that make favorite Bible stories come alive to young minds. Joseph helped the pharaoh With a very clever plan. Then the pharaoh knew that Joseph Was a very special man. Joseph's brother's jealousy and the good that came out of Joseph's journey to Egypt remind children that G-d can bring good things out of bad things. By Mary Auld Retells the Bible story in which Joseph is sold into slavery by his brothers, finds favor with the Pharaoh of Egypt, and is reunited with his family. By Catherine McCafferty This is the story of one of the Bible's most popular heroes. Joseph was the youngest of eleven brothers but it was clear from the beginning that he was different. Joseph's father set him apart, allowing him not to work, giving him special presents. His brothers became very jealous of all the attention given to their younger brother. One day while they were all out in the fields together, Joseph's brothers developed a plot to get rid of their spoiled brother. Joseph was sold to some travelers who were on their way to Egypt, and Joseph's father was told that he had been killed by a wild animal. In Egypt, Joseph's life continues to show that he has a special purpose. Dreamworks DVD and VHS Also Available. Based on the award winning animated epic of the same name, Joseph King of Dreams offers an exciting retelling of this biblical character's life. The story line weaves its way through major events in Joseph's life: his brothers' betrayal, interpreting dreams in prison, and his leadership in Egypt. Actual dialogue from the film punctuates the narration, which follows the text of the accompanying full-color storybook. Also included is "Better Than I," a memorable song from the animated version. To increase durability, librarians may want to consider rebinding options for the stapled binding on the accompanying storybook. A delightful values-based tale, this title will make an excellent addition to general listening collections, especially where religious materials are in high demand. Dreamworks DVD and VHS Also Available. This is the story of one of the Bible's most popular heroes. Joseph was the youngest of eleven brothers but it was clear from the beginning that he was different. Joseph's father set him apart, allowing him not to work, giving him special presents. His brothers became very jealous of all the attention given to their younger brother. One day while they were all out in the fields together, Joseph's brothers developed a plot to get rid of their spoiled brother. Joseph was sold to some travelers who were on their way to Egypt, and Joseph's father was told that he had been killed by a wild animal. In Egypt, Joseph's life continues to show that he has a special purpose. By Catherine Storr Retells in simple text and illustrations the story of the conflict between Joseph and his brother. By Catherine Storr A retelling of the story of Joseph. By Catherine Storr When a famine forces Joseph's brothers to travel to Egypt to buy grain, they are reunited with Joseph, whom they had sold into slavery. By Kay Arthur Aunt Sherry has an assignment in the city known as "The Big Apple." Max and Molly and Sam (the great detective beagle) are coming along -- and so are you! Amazing Comics is developing a new comic book on the life of Joseph -- one of G-d's superheroes in the Old Testament -- and Aunt Sherry is going to write it. But first there's some research to be done. Who was Joseph anyway? What makes him so special? Could he run faster than a speeding bullet like Superman? Or was he an ordinary man whom God used to accomplish extraordinary feats? So get ready to head to New York City to learn how to make a comic book while you discover just what it was that made Joseph G-d's superhero. By Marcia Williams Williams's exhilarating art, an uncommon blend of the primitive and the refined, illuminates the biblical story of favorite son Joseph, whose father gives him a glorious coat--here artfully embellished with rows of rabbits, fish, stars and circles. Sold to travelers by his jealous brothers, Joseph becomes a slave in Egypt, where he impresses the Pharaoh with his ability to interpret dreams. When the young man warns that famine will follow years of plenty, he is appointed governor of Egypt, and eventually forgives his brothers and saves them from starvation. Intricate, variegated borders surround the three or four illustrated horizontal panels that fill most of these festive pages. Williams smoothly distills Joseph's saga, and sprinkles her pictures with contemporary dialogue and asides that make the tale all the more accessible to young readers. By Pauline Youd Presents the Bible stories of Joseph, Moses, Samuel, and Esther, all of whom were taken from their natural parents and raised by someone else.